Based on a true story of a murdered schoolgirl Sophie Lancaster and her partner – killed for the way they looked, Alan Gibbons has taken this tragedy (with Sophie's parental consent) and made it his own. 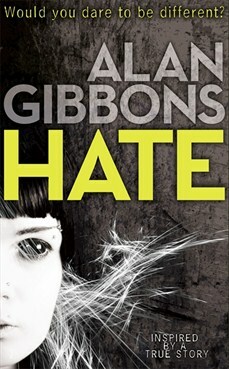 'Hate' deals with the aftermath of schoolgirl Rosie’s death and the consequences for the sister left behind and the boy who witnessed the murder and yet said nothing. Six months after the murder, Eve the sister and her best friend Jess meet a new boy in school called Anthony Broad. Eve realises to her horror that this was the boy who witnessed the murder and refuses to give testimony as the trial of Rosie’s killers. Worse her best friend fancies him and that is just plain wrong. Eve and her mother are appalled he is at her school at all and that she has to share lessons with him. Eve is even more disgusted when Anthony enters the school talent contest and stands a good chance of winning. Hate is a story about the building resentment Rosie and her mother feel towards the boy who did nothing – failing to realise that he must live with the shame and fear of that night forever too, to point they had to relocate towns and school to get away from the stigma. Hate burns strong in Eve’s heart as she mourns her lovely music inspired sister. This is a powerful story about emotions, right and wrong and how a mindless act to one person can wreck the lives of all those left behind.